Hello all! Well today is day 8 of National Novel Writing Month! I'm just a slight bit behind (not too much) but I do plan to catch up today. I've noticed that it's harder to write on the weekend because I'm surrounded by my family, and there aren't even any small children involved! I didn't think it was possible, but man are they a distraction! Don't get me wrong, I love them to death, but it's incredibly hard to focus. I do much better during the week. It's not as if I'm in complete solitude during the week (as my sister often spends most evenings at my place watching TV), but she's usually working on her own projects too, so it works out. Anyway, since I do need to get back to my writing, this post will be rather short. 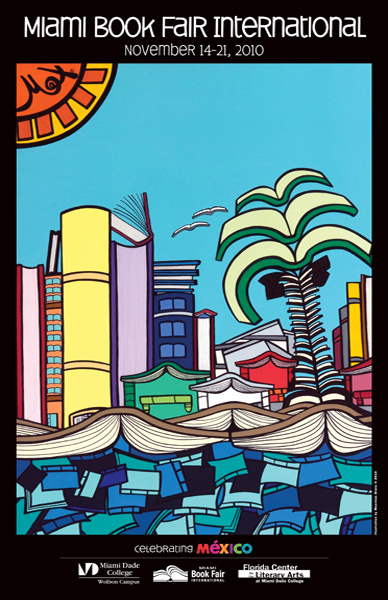 I really just had to tell you about the Miami Book Fair for those of you in Florida (Or those of you willing to travel here with such short notice). There will be so many famous authors here that it's unreal! The list includes authors such as Ellen Hopkins, Laurie Halse Anderson, Carl Hiassen, Ann Beattie, Susan Cheever, Carol Higgins Clark, Edwidge Danticat, Jennifer Egan, Dave Eggers, Laura Esquivel, Jonathan Franzen, Ian Frazier, James O'neal, Katherine Schwarzenegger, Scott Turow, Jonathan Tropper, Scott Westerfeld, Dani Shapiro, Walter Mosley, Jane Leavy, Caroline Leavitt, Larry Doyle, T Cooper, and George W. Bush. Wait, George W. Bush? No comment. Anyway, this my list just scratches the surface. The official list is quite extensive. The fair takes place from November 14-21. The Street Fair takes place during the 19-21 and will feature booksellers and exhibitors, offering the opportunity to browse new and favorite titles from major publishing houses, small presses, scholarly imprints and foreign publishers. There will be millions of books in multiple languages, book signings and musical entertainment. Many authors will be giving talks on various subjects. Tickets for the Street Fair are free and Tickets for the 2010 Evenings with Series Author presentations are $10. Visit the website for more information. I also want to add that I'm going to be in Miami this weekend, and thought the fair was going to be this weekend. I was horrified (yes, it's that serious) to discover that it's actually next weekend. I doubt I'll be able to make it to Miami 2 weekends in a row, but I guess we'll see what happens. If you're lucky enough to go, have fun! And don't forget about The Black Fox Literary Magazine's Fiction Contest and Cover Art Contest going on now! Oh, and playlist.com often doesn't have the "song of the day" that I want to use. If that happens I'm just going to provide a link below the song where you can listen to it. Does Anyone have a better website with the same playlist.com concept? Remember me from the conference? I am hoping to go to the Miami book fair as well. Just trying to finalize rides and dates, etc. Let me know if you decide to go, it woud be wonderful to meet up or something! I'm doing Nanowrimo as well! Quite invigorating so far. Email me your Nano Username and we can be writing buddies.